Finally a bit of sunshine today, so I went out and shot a couple of rolls and played a bit with my instax taking 5 shots. Since the instax was lots of fun and I’m pleased with the results I decided to try to scan one for you to see. They are not that easy to scan thanks to the glossy surface – it creates Newton rings – and so I made a little improvised cardboard mount to keep the surface of the prints off the glass. With this I managed to scan them alright in the end. The size in which you see the shot here is a bit more than double of what it’s like on the print itself and it still holds up in sharpness! Scanning them in the resolution I use for negatives obviously doesn’t quite work, but that’s not how this is meant to be used anyway. In any case, I’m very pleased with the quality and definitely like the feel of this. Next time I also do a better job at dust-spotting, I definitely missed some in this one. And please ignore the slur in the background …! The puppy was only partly cooperative and I couldn’t quite choose my framing exactly. That these sentiments still exist in this day and age always baffles me. 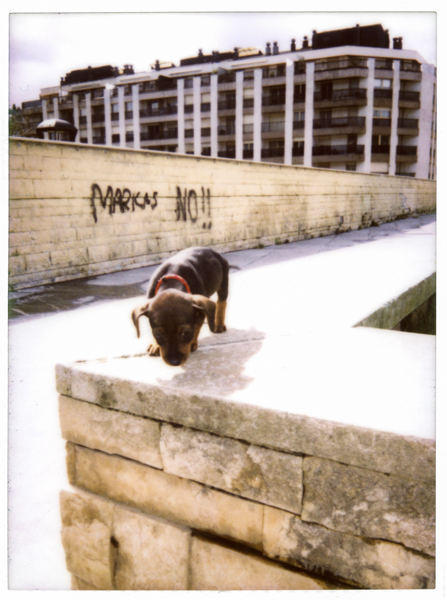 Taken with: Fuji Instax mini 8.